Boost Your Capabilities Using Low-Cost Arduino Microcontroller Boards! After getting you set up on an Arduino board, veteran ham radio operators Jack Purdum,W8TEE, and Dennis Kidder, W6DQ, start with a simple LCD display and move up to projects that can add hundreds of dollars' worth of upgrades to existing equipment. 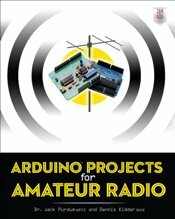 This practical guide provides detailed instructions, helpful diagrams, lists of low-cost parts and suppliers, and hardware and software tips that make building your own equipment even more enjoyable. Downloadable code for all of the projects in the book is also available.